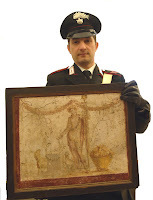 The Italian Carabinieri have issued a press statement relating to the recovery of a Roman fresco in London (see also "Stolen Roman fresco recovered in London", ANSA February 13, 2009). It appears to come from a villa at Boscoreale near Naples. The fresco, showing the god Dionysos, was identified in an unspecified London gallery on October 29, 2008 and then handed over at the Italian Embassy in London on December 23, 2008.